Im a xbian user since a a couple of months ago. Everything goes well but I have this issue that annoy me. Here my problem in the template. I have found this as well https://github.com/xbianonpi/xbian/issues/393 but I think that it's old and resolved. Just connect with windows (8.1 in my case) and putty. I tested it in a W7 virtual machine, all my semi graphic characters are displayed as expected. Only German umlauts are not displayed correctly (I'm using default setting in putty). But when I select UTF-8 in putty, all semi graphic characters are NOT displayed correctly but umlauts are ok. So best is you're using putty defaults an post a picture here what you are getting. 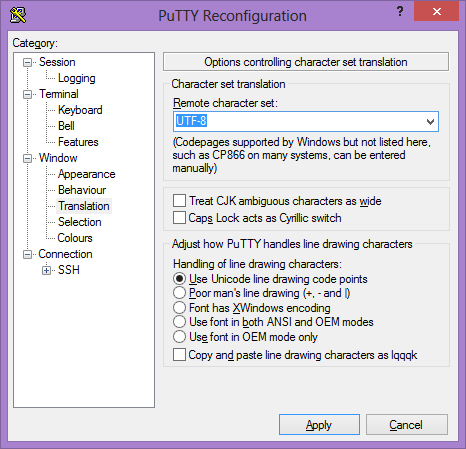 IMO it is windows/putty console issue. (5th Sep, 2016 05:33 AM)naox Wrote: I have found this as well https://github.com/xbianonpi/xbian/issues/393 but I think that it's old and resolved. I have change from "UTF-8" in putty to "Win1252 (Western)" and now it works. Current time: 26th Apr, 2019, 12:40 AM Powered By MyBB, © 2002-2019 MyBB Group.